Larry J. Sabato's Crystal Ball » House 2014: A narrowing battlefield? We do not yet know the exact number of districts with split House/presidential results, but we know enough now to have a ballpark estimate. So far, Daily Kos Elections — a left-leaning web site that does an outstanding job of providing reliable information about presidential performance by congressional district — has tabulated these results in about two-thirds of all districts, and that combined with our own analysis suggests that there were about 20-30 districts with split House/presidential results (we’ll update with a final number when the results become clear). Even at the high end of the estimate, that’s only 7% of all districts. Such a level of polarization is not necessarily unprecedented, though — incomplete figures in Vital Statistics go back to the turn of the last century, where such polarization in congressional districts was common. For instance, Vital Statistics notes that of 310 districts where data were available in the 1904 election (out of 391 districts in that Congress), only five districts picked a different party in their House and presidential contests (only 1.6% of the districts measured). Given that the complete data from that election are not available, we cannot definitively say the number of split districts was lower than the number produced by this election, but the results from 1904 (a blowout victory for Theodore Roosevelt) still indicate a rather remarkable lack of ticket-splitting. More recently, in 2004 — which, like this presidential election, was relatively close in the national vote — only 59 of 435 districts (14% of them) divided their presidential and House votes between the two parties. In 2008, there were 83 such divided districts (or 19% of all seats). Because districts with split results are the most obvious targets for congressional strategists on both sides of the aisle — if your party’s presidential candidate can win a district, it would stand to reason that a good congressional candidate could too, even potentially against an incumbent — the small number of crossover districts would seem to suggest a rather limited House playing field in 2014. Of course, a House wave in one direction or the other could crack open the map and put some more seats in play. Given what we know about “sixth-year itch” elections — the second midterm of a two-term president — and the generally more conservative composition of smaller midterm electorates, the history would seem to suggest that the Republicans have a greater opportunity to go into November 2014 with the wind at their back. But there’s nothing to say that Democrats might not be in good shape by the next midterm, particularly if the economy improves. It’s also possible that 2014 will be a relatively neutral political year, where there isn’t much net change at all in the House. Midterms such as 1998 and 2002 are recent examples of stable midterms where the incumbent president’s party (Bill Clinton’s Democrats in 1998 and George W. Bush’s Republicans in 2002) bucked typical midterm history and made modest gains in the House. Still, in 35 of the 38 midterm elections held since the Civil War the incumbent president’s party lost ground in the House. With all that in mind, what follows is an early regional breakdown of where the action in the House might be in the next cycle. Some of the seats mentioned here might not actually be that competitive, and some of the seats not mentioned might become competitive for any number of reasons. 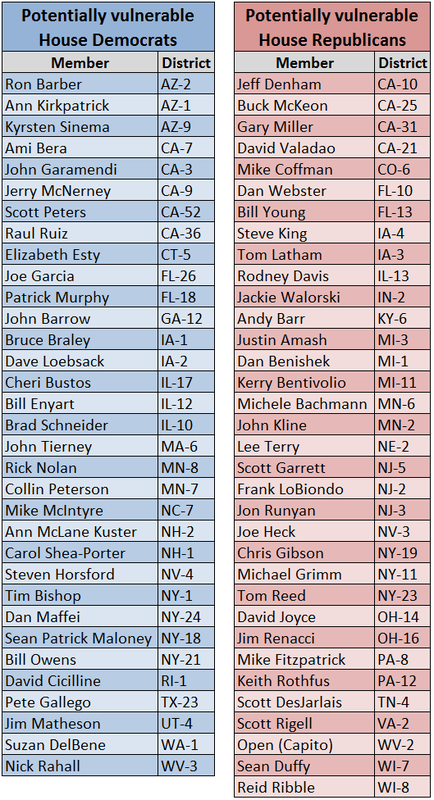 Chart 1 lists all the members of the 113th Congress mentioned in this article who are potentially vulnerable going into the 2014 cycle. Republicans ran strong challenges against Reps. David Cicilline (D-RI) and John Tierney (D-MA) in 2012 — Tierney’s survival was an Election Night surprise to many — but both were harmed by specific personal liabilities (Cicilline’s unpopular time as Providence’s mayor and Tierney’s family’s legal problems) that might fade over time. Tierney is more vulnerable, particularly if his 2012 foe, Richard Tisei, runs again. Republicans could also benefit from a repeat candidacy from Andrew Roraback, a moderate Republican who narrowly lost to Rep.-elect Elizabeth Esty (D) in an open Connecticut seat currently held by Sen.-elect Chris Murphy (D). President Obama actually improved his performance in New Jersey from 2008 to 2012 — going from 57% of the vote to 58% — but Democrats and Republicans split the delegation 6-6. Republican Reps. Scott Garrett, Jon Runyan and Frank LoBiondo occupy districts that, at least on paper, might be winnable for the right Democrat; all three Republicans were included on a list of 35 Republicans the Democratic Congressional Campaign Committee is targeting with robocalls in regards to the fiscal cliff negotiations (no, the campaign does not ever stop). New York, with its 27 seats (tied with Florida for the third-biggest House delegation in the country), will again have a number of competitive seats. Democrats likely will take another run at Rep. Chris Gibson (R), who occupies a swing district; Rep. Tom Reed (R), who only won by four points over surprising challenger Nate Shinagawa (D); and Rep. Michael Grimm (R), who continues to face legal and ethical questions. Republicans, meanwhile, will focus on Rep.-elect Sean Patrick Maloney (D), who won a narrow victory over outgoing freshman Rep. Nan Hayworth (R); Rep.-elect Dan Maffei (D), who won in 2008, lost in 2010 and came back in 2012; Rep. Bill Owens (D), who has scraped by in his two general election victories; and Rep. Tim Bishop, who occupies a highly competitive Long Island seat. All in all, New York should feature many competitive races on both sides in a state where Democrats already control 21 of 27 seats. Thanks at least in part to an incumbent-protecting gerrymander instituted by Virginia Republicans after they took unified control of the state government following the 2011 elections (and also in part to Republican U.S. House gains in 2010), the GOP controls eight of 11 Old Dominion seats, and none appear obviously competitive in 2014 except possibly the swingy 2nd District seat held by Rep. Scott Rigell (R), who fought off a well-funded challenger in 2012 without too much trouble. About half of the states in the region — Alabama, Arkansas, Louisiana, Missouri, Mississippi, Oklahoma and South Carolina — have no obviously competitive House races at the moment. Of the others, Rep.-elect Andy Barr (R-KY) may or may not face a strong challenge in the Lexington-centered seat; fears of an Obama “War on Coal” boosted Barr here, and a Democrat might have a hard time winning a federal election in a district like this, at least while Obama is still in the White House (the president only won 42% of the vote there). Perhaps a more intriguing case study is another Coal Country seat, that of Rep. Shelley Moore Capito (R-WV). Capito is attempting to move up to the Senate, and this will be a good test as to whether a Democrat can win an open seat in a state where their statewide brand remains durable but where their national brand is a giant liability; the candidates here on both sides will matter, and there are a lot of quality names that have already emerged on both sides. Republicans, meanwhile, will again target Rep. Nick Rahall (D-WV). In Tennessee, Rep. Scott DesJarlais (R) will be an inviting target in a primary — and a general, if he makes it that far — because of some horrible headlines about his asking a mistress to get an abortion (among other unsavory details about this ostensibly pro-life politician). But it would be a big surprise if, at the end of the day, the Volunteer State’s nine House seats were not occupied by seven Republicans and two Democrats, the current lineup. Probably the only House intrigue in Georgia and North Carolina is whether Republicans can finally knock off persistent targets Reps. John Barrow (D-GA) and Mike McIntyre (D-NC), two 2010 and 2012 survivors with strong personal brands in districts that performed well for Mitt Romney. In the case of these two, a midterm electorate could be a blessing — Obama won’t be on the ticket, which could enhance their ability to run localized campaigns. There are question marks in both Florida and Texas, where lingering court challenges might force the creation of new congressional maps in either state. We won’t hypothesize about what could happen; assuming the current maps stand, only one of the Lone Star State’s 36 districts stands out as a potential 2014 battleground (the large El Paso to San Antonio seat of incoming Democratic Rep. Pete Gallego, where outgoing Republican Rep. Quico Canseco might seek a rematch). Meanwhile, both sides will probably look for targets in Florida: Democrats are intrigued by the seat of Rep. Bill Young (R), who could retire, and Val Demings — an impressive challenger and former police chief who lost a close race in 2012 — might again challenge Republican Rep. Dan Webster. We’ll have to see if New York City Mayor Michael Bloomberg’s boutique SuperPAC, which spent more than $2.3 million to support Demings in 2012, would boost her again in 2014 (if it’s even around by then). On the flip side, Republicans will likely target two seats they lost in 2012: Rep.-elects Patrick Murphy (who defeated lightning-rod outgoing Rep. Allen West in a district that Mitt Romney won) and Joe Garcia (who beat scandal-tarred outgoing Rep. David Rivera in a district that appears to be trending more Democratic). Where Pennsylvanians sit might determine where they stand on the question of whether the Keystone State is part of the Northeast or the Midwest (Philadelphians might think the former, while Pittsburghers might think the latter). Penn State’s move into the Big Ten in the 1990s is certainly one argument in favor of it being in the Midwest, but current big-time university athletics machinations confuse the issue (New Jersey’s Rutgers and the University of Maryland are moving to the Big Ten, but no one would place those states in the Midwest). In any event, while Pennsylvania is typically and probably rightfully listed among the Northeastern states, its inclusion in this Midwestern section is deliberate for the purposes of this article, because its recent political history resembles that of its western neighbor, Ohio, and two other Midwestern states, Michigan and Wisconsin. All four states voted for President Obama twice, but sandwiched in between those two presidential contests was 2010, which saw each elect a Republican governor to succeed a Democratic one (all but Ohio, where John Kasich beat incumbent Ted Strickland, were open seats). Additionally in 2010, Republicans gained 14 House seats — or nearly a quarter of their 63 net seats added — in just these four states. Those Republican governors, with the help of Republican legislatures, helped lock in GOP U.S. House gains in all these states during decennial redistricting, completed last cycle. As at least a partial consequence of these actions, Democrats did not defeat a single Republican incumbent in these states in 2012. Democrats will take swings at several districts in these states in 2014. The most plausible targets are probably Rep. Mike Fitzpatrick and Rep.-elect Keith Rothfus (both R-PA); Rep.-elect David Joyce and Rep. Jim Renacci (R-OH); Rep.-elect Kerry Bentivolio, Reps. Justin Amash and Dan Benishek (R-MI); and Reps. Sean Duffy and Reid Ribble (R-WI). But Democrats targeted most of these seats to at least a certain extent in 2012 and were unsuccessful. Benishek, who barely won his Michigan Upper Peninsula-centered seat, is probably the most endangered Republican mentioned here. Joyce, who replaced the retiring Steve LaTourette in a moderate Northeast Ohio district, will presumably face a real opponent in 2014 (LaTourette announced his retirement too late for Democrats to field a competitive challenger). Also, Bentivolio occupies a pretty reliably Republican district (it was held by Republican Rep. Thad McCotter before McCotter messed up his petitions to run for reelection), but he is disliked even by his own party and might not survive his next primary (or general) contest. The flip side of the Republicans’ solidification of their existing seats in these four states is that they essentially have no seats to target as potential gains. An inability to really pick up seats in these four important, swingy states could effectively limit the number of seats Republicans could gain nationally even in a wave year. Then again, given that they already hold a majority bigger than any of those they held during their run of House control from 1995 and 2007, Republicans don’t have a ton of room to grow their caucus. Across the rest of the Midwest, Republicans are going to have to decide whether they want to heavily invest in Illinois, where Democrats made big gains but where the state’s former junior senator will not be on the midterm ballot. If he wants to again compete for the highly Democratic but competitive 10th District, outgoing Rep. Robert Dold (R) might again wage a strong campaign against Rep.-elect Brad Schneider (D); so might outgoing Rep. Bobby Schilling (R) against Rep.-elect Cheri Bustos (D). Democrats have named the seat of Rep.-elect Rodney Davis (R) as one of their top 2014 targets; it’s the only competitive Illinois seat they didn’t win in 2012. Republicans might also take a crack at the trending Republican Southern Illinois seat of Rep.-elect Bill Enyart (D), but he ran a very strong race in 2012 and should not be discounted. All four of Iowa’s districts are potentially competitive, but if the incumbents decide to run again (Democratic Reps. Bruce Braley and Dave Loebsack and Republican Reps. Tom Latham and Steve King), they will be favored. But if one decides to step up to run for statewide office, an open-seat race in any of the districts would at least be on each party’s national radar. Braley and Latham are the likeliest candidates to run statewide, with Latham’s district (he defeated a fellow incumbent, Democrat Leonard Boswell, to win it this cycle) likelier to flip in the event both became open. In Indiana, keep an eye on the 2nd District, formerly held by Sen.-elect Joe Donnelly (D). Rep.-elect Jackie Walorski (R) won a tight victory over veteran Brendan Mullen (D) — indeed, this race was a lot closer on Election Night than observers in both parties seemed to expect. Mullen might run again. These states are all grouped together because there simply aren’t that many obviously competitive seats in this entire combined region, stretching from the Dakotas in the North to Arizona in the Southeast. It will take some currently unexpected development, like a retirement or scandal, to make any of the seats in Idaho, Kansas, Montana, New Mexico, North Dakota, South Dakota and Wyoming competitive. The House battle in Republican-leaning Arizona will be largely fought in three districts the Democrats narrowly won in 2012: the 1st, 2nd and 9th districts. One of the big surprises of Election Night was the strong performance of Republican Martha McSally against Rep. Ron Barber, who holds Gabby Giffords’ old seat. A repeat McSally run, or perhaps a challenge by another strong Republican, could again put this seat in play. Of the other two seats, AZ-1 (Rep.-elect Ann Kirkpatrick) is probably more fertile territory for Republicans, given that Romney won it, while Obama won AZ-9 (Rep.-elect Kyrsten Sinema). If there’s a state where Republicans could very clearly make big gains, though, it’s the Grand Canyon State. A national wave could push all three districts into their column. Democrats might again seriously challenge Rep. Joe Heck (R) in Nevada, and Republicans might go after Rep.-elect Steven Horsford (D). But it would take a strong challenger and a lot of money and luck to dislodge either. Meanwhile, the Utah Republicans’ White Whale — Rep. Jim Matheson (D) — still stands after winning an improbable reelection (he ran almost 19 points ahead of Barack Obama in his district). No man is Superman, but whatever Matheson’s Kryptonite is, Republicans haven’t yet figured out the formula. Back in the Plains, a stellar Democratic campaign might endanger Rep. Lee Terry (R) in Nebraska’s 2nd District. After running enough ahead of Republican presidential nominee John McCain to survive in 2008 — Obama won the district and its electoral vote that year, thanks to the way the Cornhusker State allocates its electoral votes — Terry won a narrower victory (less than three points) this time, despite Romney carrying the district. In four of these five states (besides California), there’s very little to report. The only seat that appears potentially competitive is Washington’s 1st District, but Rep.-elect Suzan DelBene (D) is a self-funding former Microsoft executive sitting in a district Obama won with 54% of the vote, and national Republicans ignored the open-seat race last cycle (incoming Democratic Washington Gov. Jay Inslee used to hold this seat). The Golden State, however, provides both sides with some possibilities. For Democrats, three missed opportunities from 2012 stand out. The first is the 10th District, where former astronaut Jose Hernandez (D) ran a spirited but unsuccessful race against Rep. Jeff Denham; Hernandez is openly considering a repeat run, although he might wait until 2016 — a clear indication that he understands the turnout problems Democrats have in midterm elections. Two other Democratic targets will likely be the 21st District, where Democrats failed to advance their preferred challenger to the general election to face Rep.-elect David Valadao (R), and the 31st, a strong Obama district where two Republicans competed in the general election (the Democratic candidate finished third in the top-two primary). The unique circumstances in this district might make Rep. Gary Miller (R) the most obviously endangered incumbent in the nation, as it is likely he is the Republican who holds the most Democratic district in the nation (at least based on the 2012 presidential numbers). A sleeper challenge could also come against Rep. Buck McKeon (R), the House Armed Services Committee chairman. For Republicans, they might take fresh shots against Rep.-elects Scott Peters (D), Ami Bera (D) and Raul Ruiz (D), who all defeated Republican incumbents in razor-thin races. They may have some other opportunities across the state, particularly if some unsuccessful but promising 2012 challengers — Ricky Gill (against Democratic Rep. Jerry McNerney) and Kim Vann (against Democratic Rep. John Garamendi), among others, decide to mount rematches. The difficulty for Republican candidates in California, though, is that their statewide party is in rump status, akin to Democrats in Texas — and, unlike demographics in Texas (which might very slowly move in the Democrats’ direction), demographics in California provide little hope to resuscitate the California GOP. At this stage in the game, there are a roughly equal number of potentially vulnerable House members (31 Democrats and 33 Republicans are listed in Chart 1). We will provide formal House ratings for all seats later in the cycle, and it’s almost certain that some of the names on this initial list will not be on that list of ratings. Remember that the race for the House always has surprises — there are unexpected retirements, candidate recruiting failures, personal scandals and other factors that can make safe seats unsafe or seemingly competitive races boring. We also have no idea what the national mood will be in 2014; history alone, as briefly recounted above, points to a good cycle for Republicans, but the past is not always predictive. We’ll know more as candidates begin to emerge and members begin to announce their retirements, which will invariably put some seats into play that aren’t obviously endangered at the moment.